Why does it seem life goes faster as you get older? There are several reasons, of course — a primary one being it always seems there’s more you need to do and less you want to do, as you get older and take on responsibilities. I know that the last 17 years, since my first child was born, has often felt like a runaway train. But there’s another reason — a set of problems I’ve been working on with my younger daughter a lot because the math is easy, but the concept is hard. You’re around 50. That means you’ve been given 2600 weekends so far, and you have about 1500 weekends left (give or take). What did you do with the weekends you’ve already lived, and what do you plan on doing with the 1500 you have left? The math is simple — what’s the average life expectancy, how many weekends are there in a year, etc. But the problem is really all about ratios. The older you get, the less percentage of your life you have left to live. Let’s put it on the opposite end of the scale to see how this works. When you’re ten, one year is 1/10th of your life. Each year is a long time, because it’s such a large proportion of what you know in life. When you’re 50, each year is 1/50th of your life. A year seems so much smaller, and hence it goes so much faster. My point here is just to illustrate the way our perception of ratios varies, and how it impacts our thinking about abstract things. Time is a good illustration because we all deal with the apparent accelerating years as we grow older. There’s another ratio problem that’s similar that we deal with all the time, though we don’t recognize it for what it is. Let’s say you start at a company that has 1,000 people. Over time, the company grows to 10,000 people. Having lived through this, I can tell the impact on culture is dramatic. Why? One reason, I think, is the pie problem. Assume the circumference of the pie represents the customers. The slice shown is one team within the company of a given size. Then the team makes up a moderate sized slice of the company, and there’s a bit of direct contact with the customer. Assuming the team size stays about the same (the area under the slice within the circle remains about the same), as the company grows three things are going to happen. First, the size of the slice as a percentage of the company is going to get smaller. Second, the contact point with the customer is going to get smaller. Third, the contact point with other teams is going to get bigger. 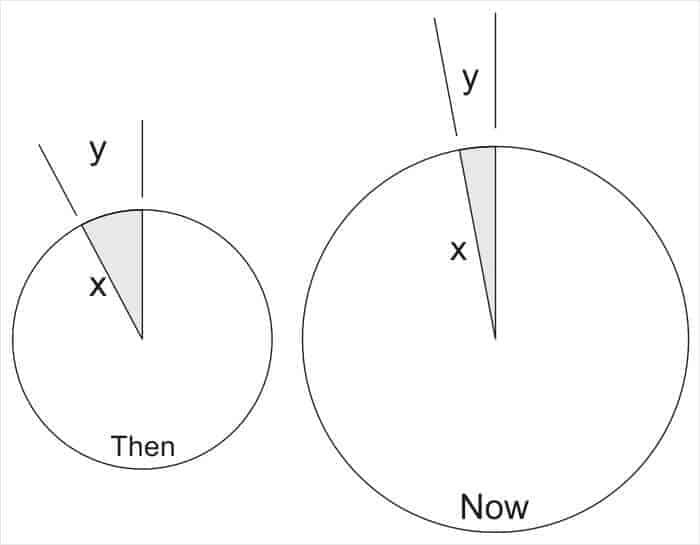 From another perspective, the ratio between x and y changes to favor x over y. Now, suppose you want to grow your team. There are two ways to grow — make the circle bigger, and make your slice within the pie bigger. At then, when the pie is small and the slice is large, it’s probably a toss-up between the two. At now, when the pie is big, the slice is narrow, and the customer contact surface has become tiny, it’s clearly easier to expand along x than y. Hence the inter-team wars over product, control over budget, etc., in larger companies. Hitting customers or product hard makes little impact in the size of the slice you own; hitting your neighboring teams to take over their territory can grow yours dramatically overnight. This problem doesn’t seem to be applicable just withing companies — it seems to apply to entire industries, as well. When the Internet was young, the router vendors fought for new markets. Now that Internet technologies are a bit older, the router vendors fight among themselves. It’s a marked difference in operation and philosophy. So, what can you do about it? At a company level, unless you happen to own the company, there’s not much you can do at all. In fact, given human nature, I’m not certain you can “solve” this problem at a large scale. Once a certain size is obtained, the threat from the other slices will always seem to loom larger than the risk of the circle itself shrinking. It’s just a matter of our perception of ratios. At a personal level, you can try to be the exception to the rule. Break down silos, focus on the size of the circle not only for your company, but for your industry at large. Instead of thinking outside the box, try thinking outside the ratios.